I’m not a huge fan of energy drinks; coffee is and always will be my go-to pick me up, whether it’s iced or practically scalding. However, since starting at Mizzou, I’ve used energy drinks more and more as a quick boost. One thing I can say? I’m paranoid about what I put into my body (closet health nut over here), but they really do work when used in moderation. Despite my doing this review, I DO recommend you have a healthy skepticism about energy drinks as well ... it’s just not natural to pump your body full of temporary caffeine. Keep that in mind! So first things first: I can’t stand Red Bull. At all. I’ve always been slightly weirded out by the marketing (Why do I need wings? I don’t like wings. Is that healthy, to sprout wings? That just doesn’t seem right...), but I decided to put my prejudices aside and give it a shot one early morning this past Friday. I’m sitting in the car dealership waiting for the outrageous bill for fixing my adorable Honda CRV (reppin’ dat soccer mom lyfe), and I crack open a can of sugar free Red Bull (that suspicious can in that suspicious light blue color all suspicious-like). Uhm. Okay. Maybe it’s just me, but is it supposed to taste like carbonated cough syrup?! It was awful! I could only finish half the can! And besides the shock to my taste buds, it really wasn’t all that effective. Maybe I should’ve given the regular Red Bull a try, but honestly, I don’t think I’m going near that brand again ANY TIME SOON. It’s not you, Red Bull, it’s me. Peace. 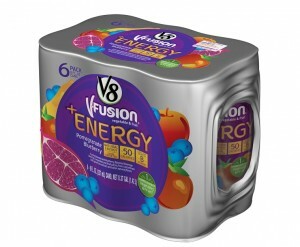 Another drink I’ve been dying to try, but can’t find anywhere, is V8 V-Fusion + Energy. I absolutely adore V8’s V-Fusion drinks because they’re not only delicioso (*hair flip* I only took three years of grammar school Spanish), but also provide one combined serving of vegetables and fruit. These drinks, according to their website, use green tea and B vitamins for their energy kick, not extra sugar or caffeine. I still don’t know how effective they are, but I’m definitely more likely to put B vitamins in my body than the extra sugar found in Red Bull. And with flavors like Orange Pineapple, Peach Mango and Pomegranate Blueberry? I just ... I can’t ... give me a moment. I’m drooling. OH, HOLD ON, WAIT. Almost forgot! I just looked at Starbuck’s website, and they have a line of energy drinks taking after their Refreshers campaign! There a three flavors, and they look quite similar to the V8 drinks. Apparently they use green coffee extract, but also real fruit juice, B and C vitamins and ginseng to make it more like fruit juice and less like coffee. I’M SO EXCITED! Anyway, keep in mind that how you wake up is entirely your own business. But if you want to keep things healthy and light, a great tip is to drink one giant whole glass of water before you do anything, right when you wake up. Your body naturally wakes up dehydrated, so you’re more likely to be tired. This trick always helps me in the mornings, and it’s become kind of a ritual. I love natural fruit juices, too ... apple, orange, cranberry, even pineapple! They’re all pretty simple options and are phenomenal for you. But hey! If you want to grab a Red Bull once in a while, go right ahead. Just know that it won’t make up for consistently inconsistent sleeping patterns. Show your body some love, and it’ll show you some right back! This article is a part of Alise's weekly column focusing on fun food ideas. REFRESHERS, THOUGH. I, too, am a energy drink 'fraidy cat.